All digital thermostats utilize digital readouts for set-points and real-time room temperature reporting. Some have control buttons and arrows that allow users to raise and lower temperatures and operate the system. “Touch-Screen” control screens allow users to select digital icons rather than mechanical buttons and arrows by directly touching the screen and making changes to set-points, modes and schedules directly on the touch-screen user interface pad. Some state-of-the-art digital touch-screen thermostats have high definition color screens that are similar to interfaces used on touch-screen “smart” phones. Screens have various back-lighting capabilities and can be configured to light up only when being used or back-lit continuously depending upon user preferences. Many can be used with outdoor air sensors that can display the outdoor temperature on the user interface screen. Others continuously display both indoor temperature and relative humidity levels of the space served. All air conditioning systems can be controlled by digital programmable thermostats that change system commands automatically according to the predetermined set-points. Schedules for system operation are pre set by the user to automatically adjust indoor temperature set-points and manage energy usage during unoccupied periods when the system is not needed for the comfort of occupants. Dehumidifiers and Water Source heat pumps equipped with Factory Dehumidification controls can be controlled by digital thermostats that allow the user to specify the indoor temperature and relative humidity level. These controls orchestrate operation of the air conditioning system and central dehumidifier automatically. These thermostats deliver precise temperature and humidity control without over-cooling. User defined indoor temperatures and relative humidity levels are accurately maintained. Each Room Thermostat controls the amount of air conditioning needed to maintain the users temperature settings in that particular area of the home. Other Thermostats control independently in other areas, all are served by the same central heating and air conditioning system. The system automatically shifts from high to low speed modes as needed to satisfy all zones. Zone systems automatically respond to heat load changes between individual rooms. Wireless Thermostats can be installed on any wall surface and location preferred without the need to conceal wiring in walls and building cavities. Thermostats with Hand-Held Wireless Remote Controls can control the heating and air conditioning system operation from anywhere within the home. All wireless thermostats require replaceable batteries. WiFi compatible thermostats use the local area wireless network in your home, business or vacant property to provide connectivity to computers, tablets and smart phones anywhere in the world. You can control and monitor one or more air conditioning and heating systems remotely using a computer or smart device. 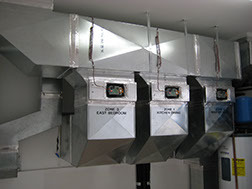 The system automatically creates an energy use log for each system. You can monitor indoor temperatures for systems up north during heating season and receive malfunction alerts if temperatures drop low enough to risk water damage due to pipes freezing. You can monitor indoor humidity levels inside vacant Florida homes and condominiums to be alerted before mold growth occurs due to high humidity. Businesses can manage multiple buildings with multiple systems and several locations to manage energy use and assist occupants remotely whenever control or comfort problems are reported by patrons or employees.